The U.S. embassy in Athens is offering 200 education scholarships to 200 refugees in Athens and Thessaloniki (100 from each city), in an effort to provide opportunities to displaced students and allow them to continue their education. The program, titled “Education Unites: from Camp to Campus”, is a collaboration between the embassy and The American College of Thessaloniki-Anatolia College, The American College of Greece – Deree, and Perrotis College-American Farm School. “Our goal is to help Greece manage the refugee crisis and refugees to acquire new skills to rejoin the academic environment,” U.S. 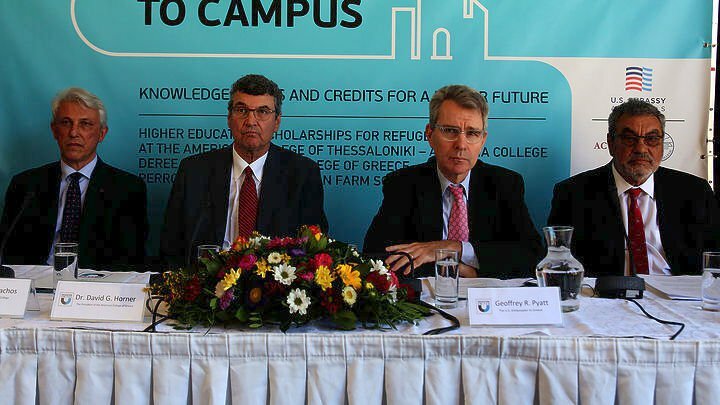 Ambassador to Greece, Geoffrey Pyatt, said in a press conference presenting the program. “The embassy and government of the United States are very proud of this initiative being implemented and shows what the U.S. approach to education and excellence is, as well as the importance we attach to strengthening the ties between the U.S. and Greece through education,” he added.